Attributed to Gerardus Duyckinck I (American, 1695–1746), Portrait of Jacomina Winkler, ca. 1735. Oil on canvas, 30 x 25 in. Milwaukee Art Museum, Layton Art Collection, Purchase L1994.2. Photo by John R. Glembin. Summer traditionally ends with dog days. You know those hot, listless, airless spans in August that have people dreaming of thunderstorms and cold fronts. But why not begin summer with a thought about dogs? 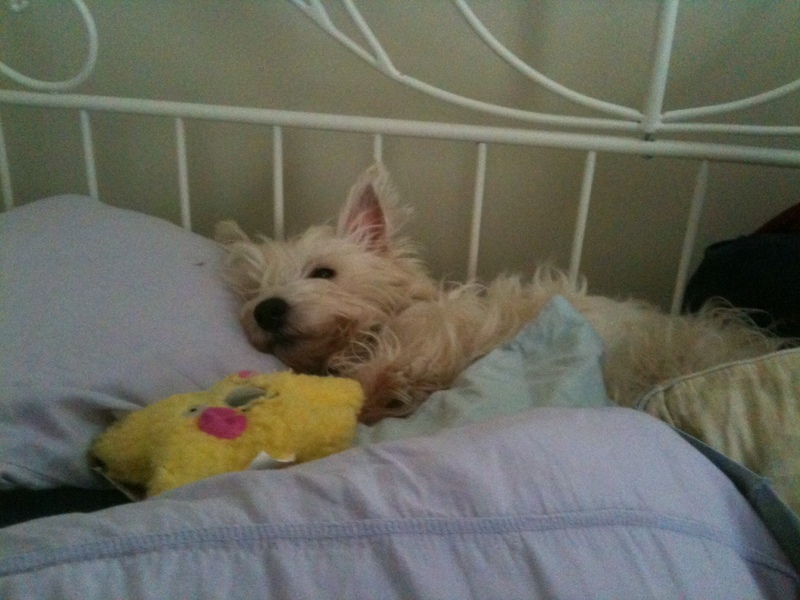 This is not hard for me, as my life is ruled by two dogs (below you’ll find a picture of one of them, my alpha Westie, Alice). Thus, this blog post combines two of my favorite things—portraiture and dogs—to take a closer look at a work of art in the Museum’s permanent collection. Around 1735, the New York artist Gerardus Duyckinck I painted the portrait of young Jacomina Winkler, who was probably ten or twelve. Jacomina’s father had been a merchant in the Dutch East Indies and had settled in Colonial New York, a place with long-standing ancestral Dutch colonial ties. There is a lot to love in this portrait, from young Jacomina’s sweet expression to the hard-edged, linear quality of Duyckinck’s contour lines. The folds in the red mantle (coat) that Miss Winkler wears are stiffer than beaten meringue peaks. But what I love the best, of course, is the dog in her lap. This is not just any old dog, but a Cavalier King Charles Spaniel…and a very unhappy Cavalier King Charles Spaniel, at that. You just know that this dog is the kind who’s going to snap at you if you try to pet it. Mary Cassatt (American, 1844-1926), Little Girl in a Blue Armchair, 1878. Oil on canvas, 89.5 x 129.8 cm. National Gallery of Art, Collection of Mr. and Mrs. Paul Mellon 1983.1.18. 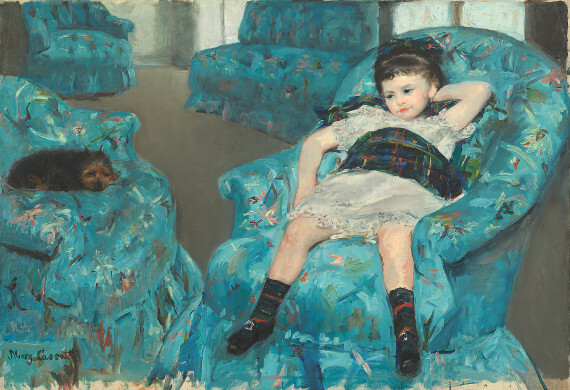 In fact, it reminds me of one of my other, all-time favorite crabby dogs in art history—the little dog sitting in Mary Cassatt’s Little Girl in a Blue Armchair (at right). Don’t even try to sit in the armchair near that little dog. It will bite you. But there’s more to this nasty little dog in the Duyckinck portrait than meets the eye. Because you see, the dog in Jacomina’s lap is a fantasy. This specific type of dog, the Cavalier King Charles Spaniel, did not exist in America when this portrait was made. Although they had a long and venerable history in the United Kingdom, where they were associated with their namesake King Charles II and the first Duke of Marlborough, they were not in fact recorded in the United States until the 1940s. Cavs were scooped by the Westie dog, which was first shown in the U.S. in 1906—another reason my dog Alice has such an inflated ego. So where did Jacomina’s dog come from? 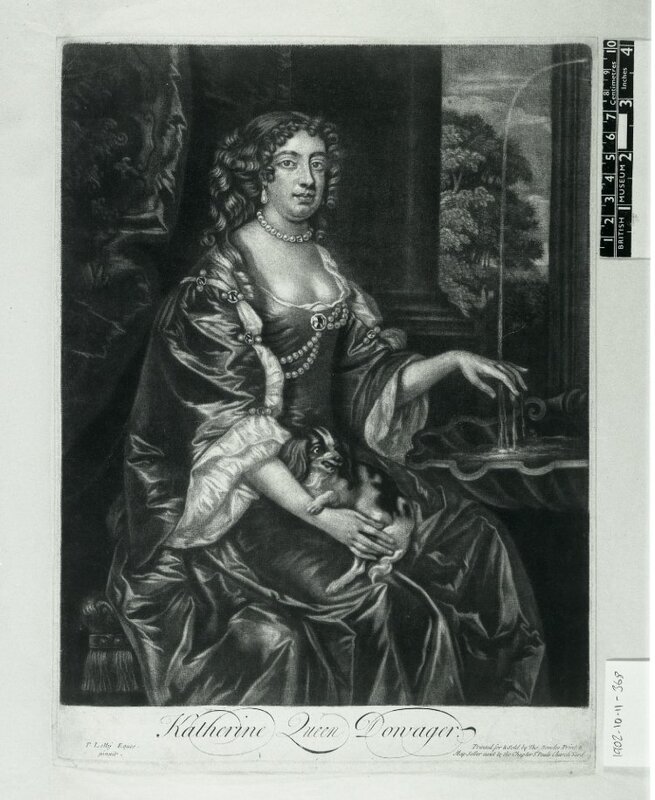 Published by Thomas Bowles Jr. (after Sir Peter Lely), Catherine of Braganza, ca. 1684. Mezzotint, 13 3/8 in. x 9 7/8 in. © National Portrait Gallery, London. This is where the specifics of the artwork begin to show us how Colonial American sitters conspired with artists to make portraits that would construct them as being just as good and noble and wealthy as their counterparts in the mother country England. John Singleton Copley (American, 1738–1815), Mrs. Jerathmael Bowers, ca. 1763. Oil on canvas, 49 7/8 x 39 3/4 in. Metropolitan Museum of Art, Rogers Fund, 1915 (15.128). Colonial American artists like Duyckinck imported mezzotint engravings based on aristocratic portraits like the one shown of Queen Catherine (above) into America. They used these prints as the basis for their sitters’ costumes, props, and poses. 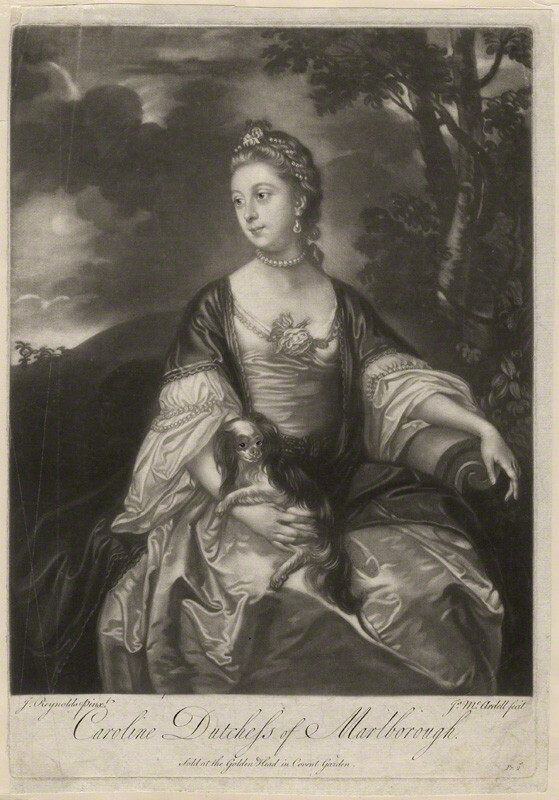 Thus, the little daughter of a New York merchant was dressed up like a queen, with a queen’s dog to match. 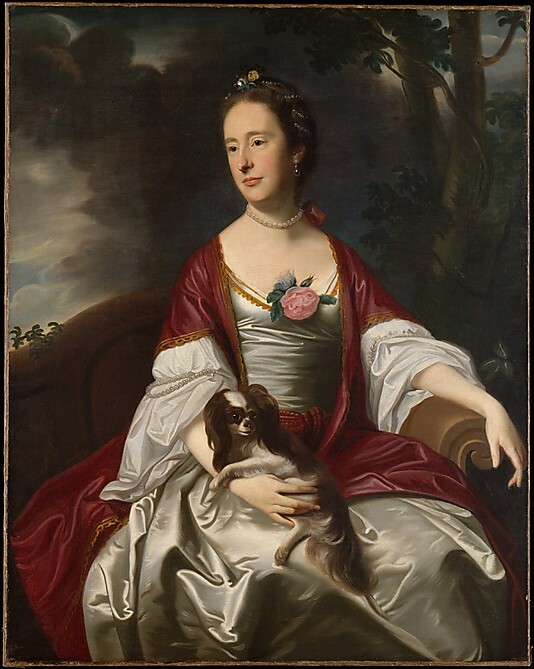 Nearly thirty years later, when Bostonian artist John Singleton Copley (Hint: The Museum has a pretty snazzy painting by him of the young Marblehead, Massachusetts debutante Alice Hooper on view on the lower level) painted Mrs. Jerathmael Bowers, he included a mythical Cavalier King Charles Spaniel as well. This painting in the Met’s collection, shown at right above, was clearly based by the Colonial American Copley upon the engraving after a portrait by his English contemporary Sir Joshua Reynolds. The printed engraving for the original painting is shown below, just like Copley would have seen it in place of the actual painting. As you can see in the arrangement and details, Copley followed this Reynolds model with precision, substituting the face of Mrs. Bowers for that of Lady Russell. By and sold by James Macardell (after Sir Joshua Reynolds), Lady Caroline Spencer (née Russell), Duchess of Marlborough, early 1760s (circa 1759-1762). Mezzotint, 14 1/8 in. x 9 7/8 in. National Portrait Gallery, Acquired Unknown source, 1961. Alice the Westie. Photo by the author. In fact, if you want to see exhaustive documentation of pets in eighteenth-century portraiture, check out this gallery from another blogger, which includes Milwaukee’s Jacomina Winkler and the Met’s Mrs. Bowers. 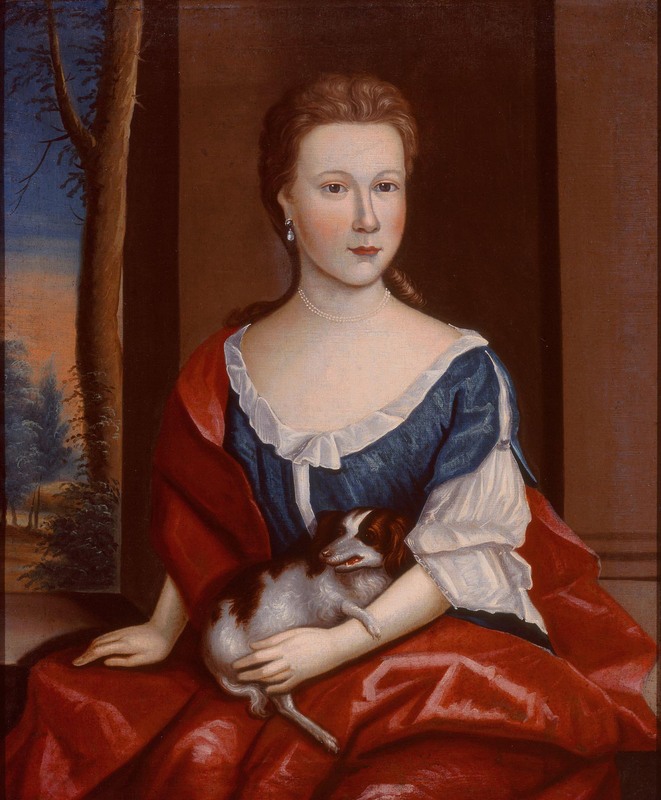 You can visit the Museum’s portrait of Miss Winkler and her cranky dog in the lower level with American paintings. And perhaps you’ll enjoy it even more now that you know the shaggy dog story behind Jacomina Winkler. Just don’t tell my dogs. They have an inflated sense of self, already! William Keyse Rudolph is the Museum’s curator of American art and Decorative arts, focusing on the Museum’s collections of American painting, sculpture, ceramics, glass, furniture, silver, and textiles from the 17th to the 20th centuries. Curator of American Art and Decorative Arts As curator of American art and Decorative arts, William focuses on the Museum's collections of American painting, sculpture, ceramics, glass, furniture, and textiles from the 17th to the 20th centuries. A self-admitted portraiture geek, he also not-so-secretly likes European porcelain, all portrait miniatures, over-the-top 19th Century historical revival objects, coffee, state fairs, cheeseburgers, and all dogs. This entry was posted in Art, Curatorial and tagged 18th Century Art, American Art, Dogs, english art, From the Collection, Gerardus Duyckinck I, John Singleton Copley. Bookmark the permalink. Art history writers with senses of humor are much too rare in my opinion — thanks for this post, and for making me laugh! Portraits continue to fascinate me — there’s so much more to them than a (possible) likeness of the sitter — I’ll definitely look at the Duyckinck differently next time I’m there. I have to admit that I’ve never seen the dog in Cassatt’s painting as being crabby — gives a whole different feel to the painting! I’ll be watching for your exhibit on bad dogs — coming soon, I hope? This such a wonderful post. Although I have not been interested in dogs in the past, I will definitely be looking out for them after reading this. I will also make a point of going to see John Singleton Copley’s painting the next time I am in the city. Your post brings out what I find so magical in art history, the little details that tell you so much more than that meets the eye. Very interesting. What about the tree and scenery to her left? It doesn’t look like a real landscape and it overlaps the window or frame. Dear William. Thanks a lot for your very great post! Jacomina is a sister of one of my wife’s ancesters (i.e. Nicolaas Verkuyl Winkler). From another sister (Maria Magtilda Winkler) I have seen (on the internet) a painting from another painter (see the link below). As you can see a lot of similarities between the painting. But a different dog (if it is a dog…;-). I am curious to your expert opinion on dogs and paintings.